"Do not dismiss the dish saying that it is just, simply food. The blessed thing is an entire civilization in itself"
For those who travel in culinary pursuits, Turkish Cuisine is a very curious one. The variety of dishes that make up the Cuisine, the ways they all come together in feast-like meals, and the evident intricacy of each craft offer enough materiai for life-long study and enjoyment. It is not easy to discern a basic element or a single dominant feature, like the Italian "pasta" or the French "sauce". 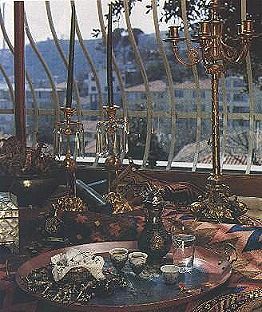 Whether in a humble home, at a famous restaurant, or at a dinner in a Bey's mansion, familiar patterns of this rich and diverse Cuisine are always present. It is a rare art which satisfies your senses while reconfirming the higher order of society, community and culture. The modern mind, in a moment of contemplation, has similar thoughts upon entering a modest sweets shop in Turkey where "baklava" is the generic cousin of a dozen or so sophisticated sweet pastries with names like twisted turban, sultan, saray(palace), lady's navel, nightengale's nest. The same experience awaits you at a "muhallebi" (pudding shop) with a dozen different types of milk puddings. One can only conclude that the evolution of this glorious cuisine was not an accident. Similar to other grand cuisines of the world, it is a result of the comoination of three key elements. A nurturing environment is irreplaceable. Turkey is known for an aounoance and diversity of foodstuff due to its rich flora, fauna and regional differentiation. And the legacy of an Imperial Kitchen is inescapable. Hundreds of cooks specializing in different types of dishes, all eager to please the royal palate, no doubt had their influence in perfecting the cuisine as we know it today. The Palace Kitchen, supported by a complex social organization, a vibrant urban life, specialization of labor, trade, and total control of the Spice Road, reflected the culmination of wealth and the flourishing of culture in tne capital of a mighty Empire. And the influence of the longevity of social organization should not be taken lightly either. The Turkish State of Anatolia is a millenium old and so, naturally, is "the cuisine." Time is of the essence; as Ibn'i Haldun wrote, "the religion of the King, in time, becomes that of the People", which also holds for the King's food. 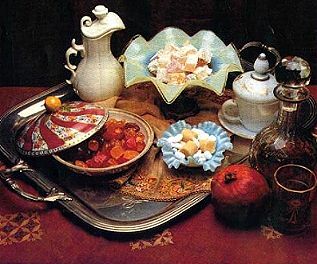 Thus, the reign of the Ottoman Dynasty during 600 years, and a seamless cultural transition into the present day of modern Turkey, led to the evolution of a grand cuisine through differentiation, refinement and perfection of dishes, as well as their sequence and combination of the meals. It is quite rare that all three conditions above are met, as it is in French, Chinese and Turkish Cuisine. Turkish cuisine has the extra privilege of being at the crossroads of the Far-East and the Mediterranean, which mirrors a long and complex history of Turkish migration from the steppes of Central Asia (where they mingled with the Chinese) to Europe (where they exerted influence all the way to Vienna). All these unique characteristics and history have bestowed upon Turkish cusine a rich and varied number of dishes, which can be prepared and combined with other dishes in meals of almost infinite variety, but always in a non-arbitary way. This led to a cuisine that is open to improvisation through development of regional styles, while retaining its deep structure, as all great works of art do. The Cuisine is also an integral aspect of culture. It is a part of the rituals of everyday life events. It reflects spirituality, in forms that are specific to it, through symbolism and practice.